Today we mourn the loss of the great Peter Falk. The former Columbo star died earlier today at the age of 83. I had the wonderful luck to meet Mr. Falk in person on several occasions. He would always to make certain to take his time and chat with his fans. He would never turn down an autograph request no matter how busy or, how many distractions he was. I remember on one occasion when I was working in Century City (Los Angeles), CA when I happened upon Mr. Falk. He was leaving the building after a meeting with his attorney. We must have chatted for 20 minutes about Columbo, Hollywood and the world in general. He was amazingly funny, glib and just a great guy! 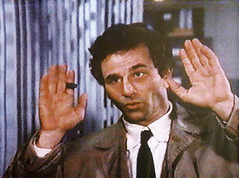 Goodbye Peter Falk, you will be missed!